He was born in Behrampur, West Bengal. 1951 Became an Asst. Director in charge of all artwork in the Victory magazine. 1955 Had a long sojourn in the South. 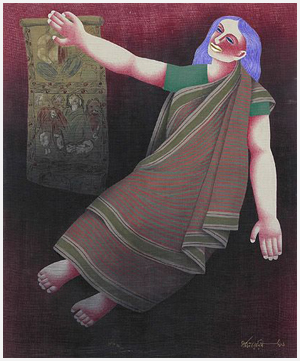 1989 Fellow, Lalit Kala Akademi, New Delhi. 1937-43 Diploma in Painting, Govt. College of Art and Craft, Calcutta. 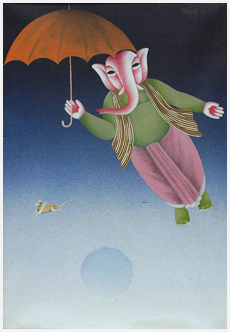 1952 Contemporary Indian Art, Travelling Exhibition, China, Japan. 1956 Delhi Shilpi Chakra Art Gallery, New Delhi. 1957 Artistry House, Calcutta. 1958 Travel India, Art Exhibition, Moscow, Germany & Poland. 1961 Marshal Kowaska Gallery, Poland. 1980 Sarala Art Gallery, Madras. 1982 `Calcutta Painters` group show, Calcutta. 1985-86 Festival of India, Paris. 1986 Festival of India, USSR. 2003 Manifestations, organised by Delhi Art Gallery, World Trade Center, Mumbai and Delhi Art Gallery, New Delhi. 2004 Manifestations II, organised by Delhi Art Gallery, Jehangir Art Gallery, Mumbai and Delhi Art Gallery, New Delhi. 2005 Manifestations III, organised by Delhi Art Gallery, Nehru Center, Mumbai and Lalit Kala Akademi, New Delhi. National Gallery of Modern Art, New Delhi. Lalit Kala Akademi, New Delhi. Art Heritage, New Delhi. Birla Aademy of Art and Culture, Kolkata. Chandigarh Museum, Chandigarh. Hydrabad Museum, Hyderabad. Madras Museum, Chennai. Delhi Art Gallery, New Delhi. 1948 First Prize, AIFACS, New Delhi. 1952 First Prize, Mysore Art Exhibition, Mysore. 1954 Gold Medal, Academy of Fine Arts, Calcutta. 1954 First Prize, Hyderabad Art Exhibition, Hyderabad. 1956 Din & Jukermans Prize, AIFACS, New Delhi. 1956 National Award, Lalit Kala Akademi, New Delhi. 1958 Certificate, National Exhibition of Art, Lalit Kala Akademi, New Delhi. 1961-62 Govt. Scholarship to travel around Europe. 1972 State Honour, Sahitya Kala Parishad, New Delhi. He began with fine but simplistic sketches of the streets and towns of Bengal, he then excelled in water- colours and subsequently in the oil medium. His ability to conserve the transparency of all mediums at the most luminous, and to work with swift, sure execution is something appreciable. 1963-77 Taught at Delhi College of Art, New Delhi.